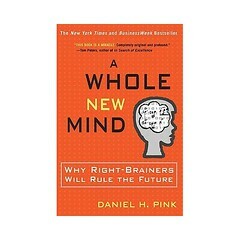 I’ve been reading through Daniel Pink’s book A Whole New Mind: Why Right Brainers Will Rule the Future in preparation for a webinar later this week. This books triggers a general (and vast) interest I have in storytelling in its many forms. Pink includes a whole section on “story” and refers to a movement called “organizational storytelling” that is really quite fascinating. He briefly profiles the work that Steve Denning helped pioneer in this area. …Denning discovered that he learned more from trading stories in the cafeteria than he did from reading the bank’s official documents and reports. An organization’s knowledge, he realized, is contained in its stories. Stories have an incredible amount of power! Power to move people, ideas and organizations forward. This same power can keep us in the dark, living in flux or simply the past. Some of the big players are getting this concept and moving it forward into the fiber of their organizations. Pink mentions 3M, NASA and Xerox. Recently I attended a performance by Laurie Anderson and learned that only a few years ago NASA made her their artist in residence. What an incredible match! How do we use these stories that float aroud us but perhaps never make the annual report? We know they play a big part in who we are. Are these the stories that tell the deeper truth of who we are as organizations? I’m curious about how anecdotes turn into story and expand into the minds and behaviors of staff and leaders. What are the stories we tell ourselves–about ourselves? A great work is to harness the power of the stories that make us–libraries, nonprofits, businesses, families–who we are, or who we think we are. How do we broaden the story? When is it time for a plot change (when anecdote starts ruling decision-making, perhaps)? There are endless ways to celebrate our stories. Now, what about those stories that simply need an ending?